Every wonder how the professionals get that tidy, finished look after spreading pine straw? I spent almost two decades in the lawn maintenance and landscaping business so can provide you with the simple installation technique we always used to satisfy our descriminating customers when installing pine straw on the many residential and commercial properties we maintained. What Type of Pine Straw Is Best? You might not be aware that there are several types of pine straw: long needle, slash, and short needle are the most common. These types of straw come from different species of pine trees, and there are big differences regarding quality and appearance. 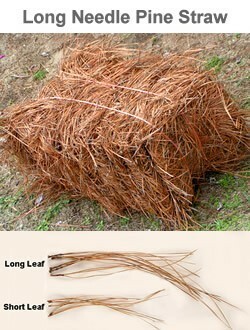 Regarding the type of pine straw you use, it doesn't matter as both can be tucked to get that finished look. That being said, long needle pine straw is by far the best of the bunch. It comes from the southern longleaf pine tree. Its needles are much longer (up to 18 inches), much brighter in color (orange instead of brown), and the needles contain more resin. The result is a pine straw mulch that holds its color 5 times longer than other types, a fluffier appearance that "tucks" better, and a resin content that significantly reduces decomposition. Needless to say, when and if available, I ALWAYS use long needle pine straw. There is no wrong time of the year to install pine straw in your landscaped areas. That being said, I usually spread pine straw in the spring and again in the late fall, after all leaves have fallen from trees. Whenever you spread spread pine straw, it will insulate roots, help to naturally block weeds, help to conserve moisture and, last but not least, makes your landscape look great! To spread the pine straw, start by removing the strings or wires from the bale. The pine straw is usually hand-baled and will be packed in compressed layers. Seperate these layers and spread them one at a time over an area. If you want a nice, smooth appearance, and want to avoid the clumped look, make sure to really shake the straw out good. NOTE: Make sure to bundle up all the strings or wires and place them in the trash can. Pets and other creatures can become entangled in strings or wires left laying around in the landscape. The depth you'll spread the straw depends on whether there is an existing coat of mulch still on the goprund, or whether you're covering newly landscaped ground. If you've already got a good base of mulch on the ground, spread a thin layer just to freshen things up. If covering bare dirt, you'll want to spread the straw a lot heavier: maybe 3 to 4 inches thick to build up a good base. Avoid spreading pine straw or any other mulch too thick over the root systems of plants and trees. A thickness of no more than 4 inches on pine straw is recommended and 1-2 inches with shredded wood mulch or bark products. If you spread mulch too thick water from rain or irrigation can't reach the roots. 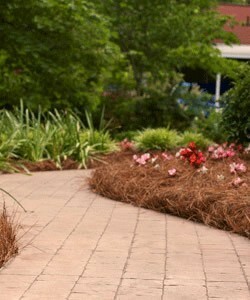 After spreading the pine straw, you'll want to tuck it around the borders. The tucking process ensures that the pine straw will stay within the borders, and it just looks nice, giving your landscape beds a "raised" look. But, before you can "tuck" the pinestraw, there's something else you have to do first. When installing the pine straw in a landscape bed, make sure to spread a thin layer (about a foot or so wide) along the OUTSIDE of the border of the bed as well. Then, after having spread the pine straw, standing inside the bed, use a leaf rake to pull the pine straw that you spread outside of the bed towards the bed line. This will give you that fluffed up, raised bed look. I usually go back with a hard rake and put some finishing touches on the tuck, working from the outside of the bed pushing any straggler needles to the bed line. Alternatively, you can use a leaf blower or showel to tuck pine straw, but I've found that rakes are most efficient. During the spreading process, make sure to keep track of and discard all baling strings or wires. Don't want pets, animals, birds, or the kids getting tangled up in them! After installation, spray the pine straw with water from the garden hose to tamp it down a little. This helps to hold it in place were a strong wind to blow. That's about all there is to it!